Film Review: ‘Senna’, and death by passion. I hardly doubt I’m the only person to have seen the documentary Senna and immediately recommended it to other people. I did just that the first time I watched it, and will continue to do so again now, having watched it yet again. ‘Senna’ documents the highs and lows of Ayrton’s formula 1 career. 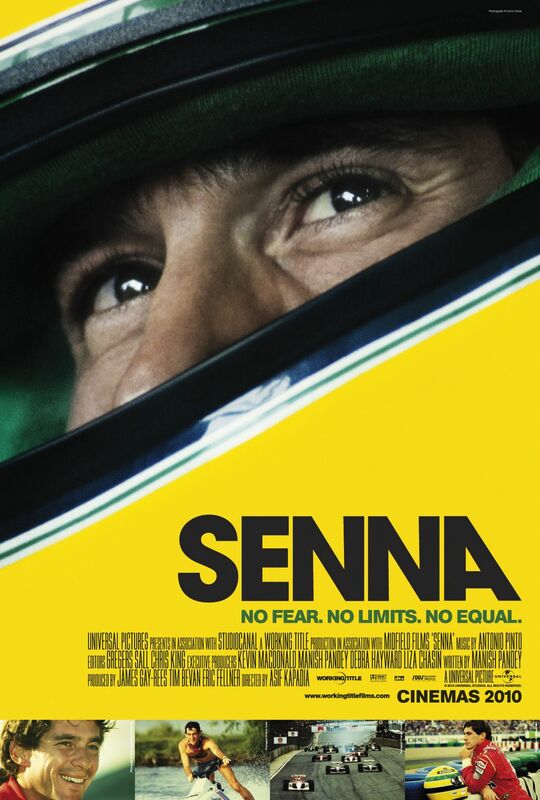 Although not a documentary enthusiast, I can easily tell that Senna is a film that stands out in a cinematic genre that is something of a niche market. Both UK and US acadamies may have an entire category to find the Best Documentary each year, but when perusing cinema listings, it’s fair to say that those generally on offer are too few and far between. Those that do get through are highly entertaining as well as informative, but just as often this entertainment is derived from the way in which their stories are told. Not that this is a bad thing however. Morgan Spurlock’s The Greatest Stroy Ever Sold is a fascinating insight into the world of product placement and cinematic marketing, but much like Super-Size Me, it hinges on his themes and ideas being told through the eyes of his exploits as much as the subject itself. Senna however, is completely the opposite. As the name suggests, it documents the career of Formula 1 legend Ayrton Senna, beginning with his early races, but only briefly. It describes his European karting origins and the Monaco ’84 Grand Prix in which he earned everyone’s attention, but goes on quickly to cover his rivalry with Alain Prost, and confrontations with the politics of the sport, personified by FISA president, Jean-Marie Balestre. The film foregoes the traditional narrator and instead uses voice overs from interviewees including members of his close family, but most often McLaren boss Ron Dennis, and ESPN commentator John Bisignano. Although it may seem that a British film relying heavily on a commentator’s voice is missing the legendary Murray Walker, it has to be said that the association of his voice, along with the lovable mistakes that often came with it, would here be somewhat detracting. More than just the voice overs however, the real highlight of Senna is what we see on screen, all of it taken from contemporary footage that includes race coverage, interviews, home movies, and even largely unbroadcast material from drivers’ pre-race meetings. With so much immersive footage, and even the titles designed to blend in with the race coverage graphics, it is hard not to feel as though you are watching the events live as they happen. But such a compelling film is nothing less than such a compelling man deserves. Driving identical cars during their seasons together at McLaren, and both possesing natural talent, it was often only the driving styles of Senna and Prost that came between them. Known as ‘The Professor’, Prost raced with his head, calculated positions meticulously, as well as, as the film tries to show, the enforcement of the rules, in order to win his four world championships. Senna meanwhile, drove with heart and passion. At the 1991 Brazilian Grand Prix, despite, or perhaps because of all his prior setbacks, he wouldn’t let even a faulty gear box deny him his first home win. Something he proudly achieved, and had to be physically lifted from his McLaren and driven to the podium in the medical car afterwards. With determination such as this, it is perhaps no surprise that a mid race car crash would ultimately be the cause of his death. Senna was one of two drivers who died during the ’94 San Marino Grand Prix weekend, after Roland Ratzenberger also suffered a fatal crash during qualifying. The first death at a Formula One race meeting for twelve years it was something which shook the sport, but not Senna’s convictions. “I can’t quit” he famously told Formula 1 Doctor and close friend, Professor Sid Watkins. Formula 1 has always been glamorous, but in today’s world of spectacle and technological achievements, it seems hard to imagine that any driver would be able to compete with Senna in any aspect of the sport. Whether such talent and determination was worth dying for is debatable, but for Ayrton Senna, nothing less was worth living for.